As the first PHI Certified Passive House in Illinois, the Ellis Passive House in Chicago exemplifies the future of low carbon renovated urban buildings. Goals. This project serves as a beacon example of the possibilities for an aging residential masonry building. Goals for the 1890's greystone included retaining the existing neighborhood vernacular on the facade, increasing natural light, exceptional energy performance, minimizing the carbon footprint, limiting construction cost, and maintaining a healthy indoor environment. Result. 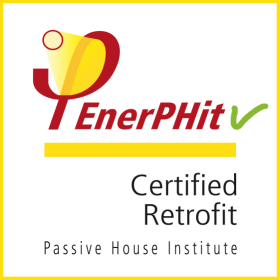 After a thorough renovation and completing a rigorous review process with ZeroEnergy Design acting as Certified Passive House Consultant, the Ellis Passivhaus in Chicago became the first Passive House Institute certified home in Illinois (built to the Passive House standard). Kenwood Construction Services and ZeroEnergy Design, transformed the antiquated 1890’s rowhome into a progressive, urban, green living environment. The newly renovated building demonstrates that families who desire a green home within city limits are not limited by building age, and do not need to compromise on style, space or comfort. The home provides exceptional energy performance, healthy indoor air quality, thermal comfort, and long term resilience, all within a Chicago row house aesthetic. Enclosure. The super-insulated air tight building enclosure includes masonry walls with dense pack cellulose and continuous exterior mineral wool and polyiso insulation that provides R-34, a roof assembly of R-61 that combines dense-packed cellulose in the rafter cavity and continuous mineral wool and poly-isocyanurate rigid insulation outbound of the roof sheathing, R-36 under the basement concrete slab, and building details to mitigate all thermal bridging. High performance U-0.13 triple pane windows/doors offer a SHGC-glass of 0.61 to capture the sun's energy. The interior of the masonry walls and underside of the roof rafters were taped and sealed to serve as the primary air barrier, yielding a final infiltration rate of only 0.65 ACH50. Systems. An air source heat pump and an energy recovery ventilator ensure that the house stays warm in the winter, cool in the summer, and provide a constant supply of fresh, clean air throughout the year. A heat pump hot water heater, Energy Star appliances, induction cooking, heat pump dryer, and LED lighting complete the high-efficiency package. Renewables. With the planned future installation of solar panels, the Ellis Passivhaus is anticipated to achieve net zero energy, producing as much energy as it consumes annually.